There are stretches of parking lot in Hollywood. The stretches of which I speak surround the Capitol Records building. Imagine turning these bleak parking lots (are there any other kind) into development. A landscape upon which life can happen. Shopping! Dining! Or, my personal favorite (and the least mentioned): a park! A proposal is currently circulating City Hall to develop these lots into a mixed-use project comprising apartments, shopping, dining, and public areas. It sounds wonderful, in theory, but when further details, including architecture renders, emerged, a loud voice of dissent arose from the community, mine among them. 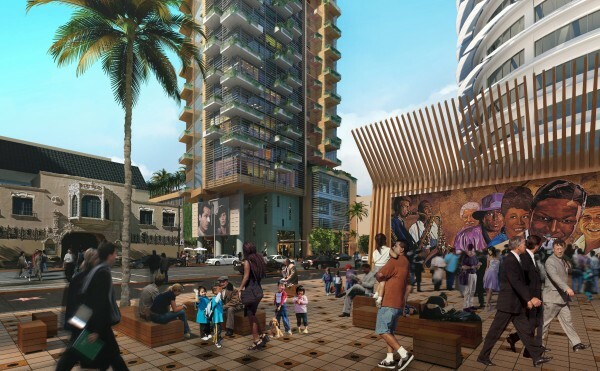 The renders show two 50-story towers stretching to the clouds, dwarfing all the other buildings at Hollywood and Vine – indeed every building in Downtown Hollywood. The towers look unfinished, with the balconies carved into columns on either side resembling the crossbars of construction scaffolding. According to plans, the towers could be as tall as 485 and 585 feet — more than twice the tallest building in Hollywood (the CNN tower). The Millennium Hollywood project will be split between two parcels across the street from each other, along Vine between Yucca and Hollywood (almost 5 acres of land). A more pedestrian-friendly experience in central Hollywood would be a much-needed improvement to not just the immediate area, but, with the Hollywood and Vine metro station just a few blocks away, to the progress of a more transit-oriented city at large. I love living in central Hollywood because I can walk to restaurants, bars, and shopping, and there are other people on the street doing the same thing. And then I can get to other parts of town without having to drive. Hollywood feels like a city, but just a hint, a feeling, a potential of a better, more metropolitan one, if only there were more people, more restaurants, more bars, more transit options, and more public space with benches upon which to sit. “The goal of all of our projects is to attract people who embrace an urban lifestyle. They want to be able to walk out their door, walk down the street, go to a restaurant, go to the movies, come home, ride the elevator, look at the Hollywood Sign from their apartment, go to sleep,” says Philip Aarons, the Founding Partner of Millennium Partners. Roschen and Handel Architects are collaborating with James Corner Field Operations, landscape architects of New York’s High Line (a bastion of successful urban public development), on the design of the Millenium’s open space, comprised of street-level plazas enhanced with retail and shopping. Again, all of this sounds wonderful, aside from the hideous tower renders. 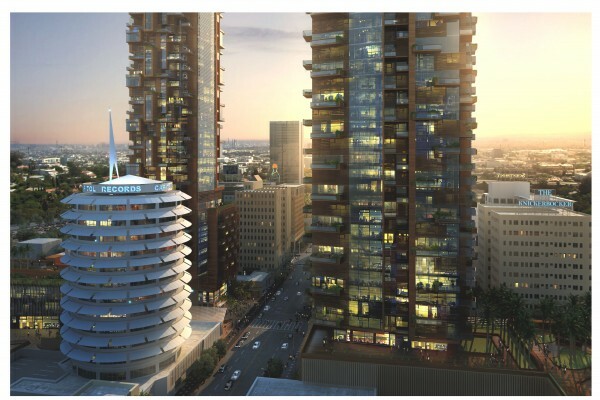 I will hope that project can be kept to scale with the current Hollywood skyline, so as to provide housing without adding significant congestion. (50 stories and nearly a thousand apartments and hotel rooms means twice as many thousands of cars – let’s not forget, that even with a nearby metro station, this is still LA, and people need cars. You still can’t get to Santa Monica from Hollywood without one, or without at least incurring a suicidal headache.) I will also hope that the Millennium Partners are sincere in and capable of providing the pedestrian-friendly experience to which they allude. Other developments have promised this, but have failed at delivering. Take, for example, California Plaza. It is nice when you’re inside it, but it’s above sidewalk level, so if you’re walking down Grand or Olive Avenues, you have no idea that there’s a large open space just up these stairs here or down these ones here or behind this building or this hotel. The same goes for the Dorothy Chandler Pavilion. Lovely on the inside, but from sidewalk level, it’s a big secret. By contrast, Lincoln Center in New York City can’t be missed by a passer-by. You see the plaza from Broadway, you see the lights inside the Metropolitan Opera house and the intermission audiences gathering outside, you see the fountain dancing, and the New York ballet students lounging around it and you want to go in and discover it for yourself. Due to an unchecked scale, and previous LA mishaps in providing a pedestrian-friendly experience (my eyes ache from the rolling they’ve been doing each time I hear a proponent mention Hollywood/Highland as an example of good mixed-use development) , I am skeptical of the Millennium Hollywood. I would love to hear your thoughts. What do you think of the plans? What would you like to see developed on these parcels of parking lot? What do you think would best help usher Hollywood into being a more urban center? Do you care for it to be such? Hollywood needs more stuff. There are areas overrun by some pretty dirty individuals, both inside and out. Just a month ago I observed two crimes (theft and murder) on my walk home down Cahuenga from Sunset to Franklin. With more stuff comes more attention from the city and the world alike. With more attention comes more security. Whats more is that, as of current, this project seems like it is catering to the residents of LA and Hollywood. That seems rare for new and shiny things on the streets of Hollywood. Obviously, I predict tourists will use it and check it out, but I am more concerned with the opportunities I, myself, have to observe beauty in my own city, and especially my own neighborhood. But I'll back up. The surface parking lots need to go. That's a fact. They're ugly. I agree that more people means traffic, until you consider less parking. With less parking, yet more attention, I believe mass transit will blossom. LA is late to the mass transit game but is playing along now. By adding attractive properties to attractive areas, the city will be pressured to bring more routes into these areas. Its losing money every second that it holds out on that. I write all this with the assumption that this project and the amenities it will provide are not for the sole use of the residents of the buildings. If that is the case, I am less for it. I want it to be for all people, wealth aside. There are some nice and shiny buildings on La Brea by crappy areas (just North of Sunset) but the inside is reserved for its residents. Castle Walls. I don't mind that the height will dwarf Hollywood buildings. I think that is inevitable. We don't have very tall buildings. Besides, with more places to live, rent should hopefully come down or level out among slightly fancier (homelier) units. I say all of the above after only reading your article, so perhaps I am missing some facts. That said, I accredit my perceived comprehension of this subject to your inclusive style of writing. So… Compliments. You witnessed a murder?! I've lived in Hollywood for 5+ years and have been lucky to never see such a thing. Yikes. I thought I told you. I was actually walking home from meeting you and Joseph at that dark Cahuenga club with my out-of-state friends. This is a great article, Channing. I'm far more bullish on the project than you because I'm confident its greatest weakness (the towers' design) will greatly improve. LA has a terrible history of killing ambitious projects because of design flaws in the early stages of the development process, but I think it is imperative that members of all sectors of our greater community work together to remedy these flaws as best we can because almost anything is better than a surface parking lot. PS: By the time this project is completed you'll be able to get from Hollywood/Vine to 4th/Colorado in Santa Monica by Metro Rail in about an hour. Nathan, agreed – anything is better than a surface parking lot. 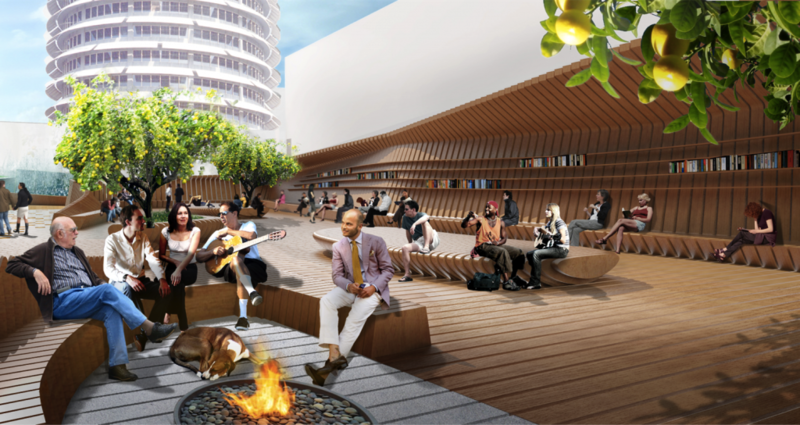 There is so much potential for these lots, as well as numerous other bleak corners of Hollywood, to be turned into culture-enhancing metropolitan centers. I'll keep my hopes up for this particular project to improve its initial weaknesses. I still think the scale of this project should be reconsidered, and that community and business leaders ought to seriously consider what number of people would be wise to fit into these two parcels of land. Can a single block in Hollywood house over 1,000 units, and many more people, without adding serious congestion? Are the 50-story skyscrapers desirable for anyone other than the real estate magnates poised to benefit financially? On the flip side is the question as to whether or not there is actually a need for such scale. Keep in mind that the Windsor condos at Sunset and Vine have continuously struggled to fill all of their units, and that isn't even a high-rise. There is nothing worse than a surface parking lot, but a close second is an under-inhabited condominium complex, designed without thought to demand. (See San Francisco's "The Brannan": http://sf.curbed.com/tags/the-brannan). I have mixed feelings on this one as well. Obviously, I'm in favor of positive, transit-friendly development in Hollywood. I just prefer to see it happen on a gradual, thoughtful scale. The positive changes from the past 8 years in Hollywood have come from development of a few plots at a time combined with organic development of existing store fronts or restaurants. That said, I do like that the planner behind the NY High-line is on board. There is potential for this to be great. However, I'm a little suspicious of the intentions behind this, to be honest. The "business leaders" behind this project don't seem to include any of the real business owners in the area. They're developers looking for cash incentive. And when (if) they visit this place after it's built, they'll be rolling up in their Mercedes SUV and pulling into a reserved parking space. They won't be slumming it on the train. In other words: these aren't philanthropists looking to improve the lives of Hollywood citizens. I'd much rather see the empty lot at Hollywood & Vine turned into a modestly sized residential & commercial space. (Actually, I'd rather see it become a park, but let's be realistic.) The scale of the new W hotel is larger than most buildings in the area, but it is wonderfully integrated with the metro station, useful commercial space, and a very welcoming plaza. I'd like to see the Millenium's development's size reduced and more attention paid to green space (not just plazas). I'd also like to see a more specific plan as to how parking garage traffic and pedestrian traffic will be routed. I'm hopeful that the scale in the renderings is just exaggerated. I can only assume that they're being a little ambitious if they think that public bookshelves and open fire pits are really going to make it past the lawyers. So, in summary, I'm skeptical of these particular plans, but am hopeful that Hollywood will move forward with positive development.